4. To design a landscape that maximizes vegetative biomass. This aids in carbon stabilization. For example a landscape that features a high proportion of paved or hard surfaces and/or high proportion of amenity lawn stores much less carbon than a landscape which features higher proportions of vegetative biomass. And we mean permanent vegetation, not material that must be constantly pruned or mown heavily, or seasonally replanted. 6. To design a landscape that minimizes the risk of weed-escapees moving into native habitats. Consider the reproductive biology of the plants selected for your garden, or the ways in which particular species can be maintained to lessen the risk of their unwanted spread (for example, deadheading or removing the flowers off Agapanthus as soon as the flowers die). 7. To design a landscape that minimizes or eliminates the use of materials that disrupt, destroy, pollute or damage natural systems/communities where they are sourced. For example, retain top-soil so far as possible in present condition, chose mulches sourced from timber industry by-product or local source by-product, avoid sleepers taken from native forest, ornamental river pebbles harvested from active waterways, and avoid plants harvested from the bush or logging coups. Choose locally sourced (eg bulk) materials to reduce product miles, where possible. 8. To design a landscape that minimizes the risk of disruption, pollution or interference to other systems. For example, the effect on non-target areas from highly toxic, mobile or residual chemicals can be catastrophic. Runoff from poorly designed landscapes can affect local systems via erosion or movement of damaging products (chemicals, soil movement, weed seed). Any existing house plans or the Land Title will be of assistance, as measurements will be shown on these and can reduce your work. Crudely draw the shape/boundaries of the garden on a sheet of paper. Measure the dimensions of the site and write all the measurements on the paper along the appropriate boundary lines etc., as shown in the illustration here. Measure the position of existing trees and other plants that will not be removed and note these on the paper. (It’s also a good idea to note plants that you are removing, as it can help with planning). When plotting the position of elements in the garden, utilise existing permanent structures such as fences and buildings, so that measurements can be taken at right angles from them. This will ensure that the position on your plan is accurate. 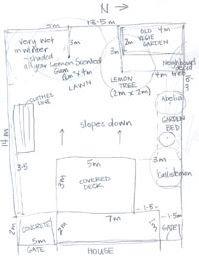 For example, to pinpoint the exact position of the lemon tree on the top right of the illustration here, the tape measure was laid out at right angles from the top fence (the tree is three metres in), and then the tape measure was laid out at right angles from the side fence and that distance is four metres in (this is noted on the paper). A careful site analysis makes it much easier to design your new garden because you will have noted anything that could have an impact on the garden’s success. a. Where’s north? If in doubt, the street directory or the GPS can help and so can a little compass! When designing a garden, the movement of the sun can be very crucial. We will discuss this more in another Part of this series. b. Take note of sunny and shaded areas. (Remember that the sun is much higher during the summer months.) Local shade will vary depending on surrounding structures eg fences, trees, neighbouring houses, as well as the seasons. c. If you know your garden well you might even be able to note the areas that are boggy in winter or particularly dry in summer. d. Slopes. Depending on what work you intend doing or having done in your garden you may need to consider having accurate levels taken, especially for any construction works. e. Soil type (and condition). Refer to the SGA information page on soils. f. Size and position of trees and other plants that are staying. g. Existing paths and other features that are staying. (These will also need to be measured and accurately noted on your plan). h. Overlooking to or by neighbours. i. Views (from windows into the garden as well as views from and within the garden). Take a note of anything that may help you with your garden plan and write it on the paper with the measurements. Remember that even minor ground depressions can be utilised. If you were a professional designer, this stage would be referred to as the Client Brief. In this case you are the client and the designer! You need to consider what you want out of this garden but keep your budget in mind. If you don’t have a lot of money to spend you might want to consider how you can implement works over time. Write a list of everything you need in your garden. For example, a garden shed, and the size you are thinking of. It’s a good idea to have catalogue information for these sorts of items, so that you have accurate dimensions. You might need an area for the kid’s trampoline and swing set. So you need to work out how much area to set aside – remember to include plenty of surrounding area for sliding off slides, jumping off swings and trampolines etc. If you are including a vegetable garden, you need to think about the size and whether it will be in ground or above ground (garden beds, pots, or upright planter beds). If you are new to vegetable growing, start small but perhaps have a plan to increase its size should you find you can cope with growing more. Vegetable gardens can be quite time consuming. And because vegetable gardens will require regular water, remember that any other high water use plants you might want to include, such as fruit trees should be planted in the same area. But be mindful of future shading of the vegetable garden. Think about the size of the tree when it has grown, as its canopy might be several metres in diameter. There are smaller fruit tree varieties available now that are small in stature but produce quite a lot of fruit. Then there are the other utility items such as clothes lines and storage areas. Do you need a cricket pitch? And if you have a courtyard sized garden, you better prioritise your needs. We’ll get onto some design solutions for smaller spaces. This could include the style of the garden. Garden design books and magazines will help you narrow in on the look that appeals to you. From a design point of view, don’t forget to incorporate standard design elements, including repetition, contrast (colour, foliage), asymmetry and surprises in to your overall ‘look’. Keep in mind when thinking about what style of garden appeals to you; you can achieve it using drought tolerant, native or indigenous plants. SGA has prepared information showing just how this is possible, and with examples of plants from the local Melbourne area that would be appropriate. Download a pdf of our Garden Plan examples for some more ideas. Make a list of your favourite plants, textures, foliage colours and flowers. 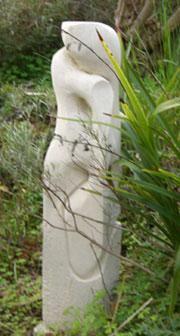 Sculpture and artworks might be considered. Even a very small budget can cope with a bowl of water on a rock and this can be as effective in the right surrounds as any expensive sculpture. Take your time to think about what you really need and want in your garden. Some more questions to get you thinking . . .
Do you like winding paths and surprises around corners, or do you prefer a vista of a garden? Do you entertain outdoors a lot? If so, you may need to consider an entertaining space as a need. Do you have pets and how might you cater for their needs, especially rambunctious dogs and young plants? Are there any other considerations relating to the wider landscape that you might need to consider, such as bushfire, heritage and tree overlays? If you are considering built structures, contact your local council to find out their requirements regarding permits etc. And while you’re at it, ask for their list of garden weed plants in your area. Movement throughout the space is a key aspect. Movement is not only important for navigation around the space, but should be factored in (eg the placement of paving stones) so that compaction of soil can be avoided, which affects soil drainage and nutrient uptake by plants. We will now adjourn to the drawing table (a la kitchen table), with crude hand drawn plan with site measurements written on it, a site analysis, a firm idea of wants and needs, and a firm idea of limitations budget-wise. All drawing from now on should be to scale. This means that the measurements on the paper must reflect actual membership but smaller scale. In landscape drawing we often work in the 1:100 (which means that 1 cm on the paper is equal to 100 centimetre on the ground. This is the same as saying the 1 cm on the paper is equal to 1 metre on the ground). 1:50 is also a common scale. 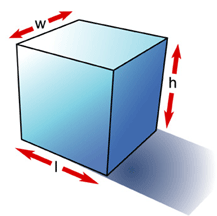 This means that 1 cm on the paper is equal to 50 cm (or half a metre) on the ground. For even more detail, the 1:25 scale means that 1 cm on the paper is equal to only 25 centimetres on the ground. A 1:50 scale is most often the best, as the plan can provide enough detail at this scale. For larger properties, many different drawings may need to be produced, including Shadow Diagrams and Section Elevations. Scale rulers are available at office suppliers. Tracing paper is good to work on, as you can put another sheet on top and quickly rework if necessary. Often it is available by the sheet in larger sizes too. The size of your garden and the scale you want to show will dictate the size of the paper! What is the longest measurement on your rough drawn plan – maybe it’s the measurement from one end of the garden to the other? If it’s 15 metres that will be 30 cm on your paper if it’s at the 1:50 scale. There is a multitude of professional tools available but for the one-off (or maybe a couple-off) home design plans most of them can be avoided. A scale ruler can be handy but is not a necessity, cheaper drawing pens are quite suitable, and a template of scaled circles (as shown here) is mighty useful for drawing plants to the right diameter. An H pencil, which is quite fine, is good for drawing on the tracing paper, whereas an HB or heavier leads 2B and 4B are good for sketching (this depends on personal preference too). A bendable curve (also shown here) is useful for shaping curves. And a triangle will help with right angles. 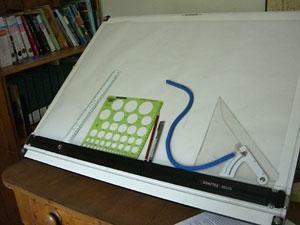 A drawing table like this portable one costs about $180, but even a smooth, clean and dry kitchen table will do the job. All those rough drawn lines with the measurements on them (refer to the illustration in Part 1), must now be transferred accurately to your paper. This can be time consuming, depending on the level of detail and size of your garden. Draw up all the basic building and boundary measurements first. 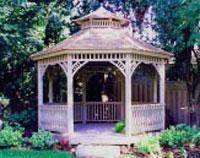 Next, incorporate the elements you are keeping from your existing garden onto your new plan. Trees and other elements that are staying must be put in the right spot and shown at the right size and dimensions. For existing trees, this means that your circle template reflects the actual spread of the canopy – or rather, the diameter of the canopy. This is important to help you gauge shading effects when placing your new plants and elements. Keep your scale in mind when drawing. For example, when you are drawing your new deck, go outside and measure your new dimensions on the ground too and actually see the size of it. Paths need not be all the one size, but consider how they are to be used. For example, you don’t want to make the access path to the shed very narrow as you need to be able to negotiate it with a wheelbarrow and tools spilling out. Consider the view out of your windows and what you will be looking at. You don’t want to spoil a potentially appealing view by sticking the new garden shed right in the way. And the same goes for artworks or focal points too. Think about where they will be viewed from – out of windows and when walking around the garden. Consider how quickly and easily you need to get from one point to another. Sometimes we don’t just want to meander around, sometimes we are out there working, and easy access and speed can be a necessity. At this stage think about the size of the plant and the look you want for a particular location, rather than the specific plant. For example, you have decided that along a path’s edge a groundcover that has yellow flowers most of the year would be ideal. In another area you are thinking that a shrub with grey foliage that will grow to a maximum of 2 metres will look great next to the existing native hibiscus (Alyogyne huegelii) and its bright purple-blue flowers. You can write this briefly on your plan in light pencil to help remember what you have in mind. When drawing in plan view, all you can show is the diameter of the plant, not its height. Using a thicker pen on the final drawing gives the illusion of a more dominant (bigger) plant. The diameter that’s shown on the plan is the plant’s diameter at maturity, not when it was first bought in the pot! Adding a Rain Garden or designing a pond is one thing, but building them is quite another. Keep in mind your budget and capabilities when designing these sort of elements and structures. You may need to consider expert help, or even a builder for some of the built structures. Local councils have lots of information of this kind. A plant’s suitability for the job, the site and the position, is the rule for all plant selection in sustainable design. By this we mean that the plant will do what you want it to do (for example, provide shade or screening), its suitability for the climate and microclimate (for example, roses might be very suitable for your climate, but not if they will be sitting under full shade all summer long), and, most importantly, the soil. Not only does wise plant selection make life easier from a maintenance point of view but it is a key to true sustainability. After all, many plants die simply because they are placed in the wrong spot or are not suited to the local soil characteristics (sandy, loamy, clay or combination soil). In recent times, drought tolerance has been a key criteria for plant selection, and there’s no signs that this will change soon in (change to) various regions. Weather patterns are a lot less predictable, nowadays. It’s becoming equally important to select plants that tolerate extreme conditions, ie. heavy rain, high winds, and severe heat, as well as drought. This need not impact on the style of garden, as plants tolerating extreme conditions can be found to suit all garden styles. An important point to remember is to avoid environmental weeds. Your local council should be able to provide you with a list of weeds that are a problem in your region. Otherwise, Google is a great resource! If you have any doubt, simply type the botanic name of the plant and check out Australian websites. If it’s a weed, it will come up on sites such as Weeds CRC, council sites and many others. Another important issue is the state of your soil, especially if you are going to be creating your garden on a recent building site. If the topsoil has been lost and you are left with subsurface clay and the like, you will need to improve your soil well before planting. Recycled green waste compost and soil improvers are available in bulk and should be added to your soil months ahead of planting. This will allow time for worms and soil microflora to recolonise and create a more suitable planting environment. Avoid importing topsoil, as this is usually from an unsustainable source. Try to work with the top-soil on site, as this can always be ameliorated and is teeming with important organisms (biota). A useful book on the subject of soils is Gardening Down-Under by Kevin Handreck (published by LandLinks). Indigenous plants are plants that grow naturally in your area. They have evolved with the local climate and the soil, so are usually perfectly suited to your environment. However, if you have a recent building site and are looking at subsurface clay etc, as mentioned above, you will still need to improve your soil prior to planting. There are many advantages to using local plants besides their ability to thrive in your garden. They are often low maintenance and thrive without the addition of fertilisers or pesticides and they provide food and shelter for native wildlife. There are indigenous plants to suit any style of garden, so you don’t have to have a bush garden if that doesn’t appeal to you. Do not remove indigenous plants from parks and bushland. Your local council should be able to provide you with information on nurseries that grow indigenous plants. 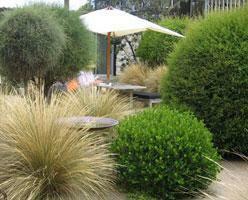 Native plants are Australian plants that aren’t necessarily from your area. Native plants can offer similar benefits to your garden as indigenous plants and once again, don’t necessarily dictate a bushland garden style. The book, The New Native Garden – Designing with Australian Plants by Paul Urquhart (published by New Holland Publishers) offers great suggestions on using native plants in any style of garden. 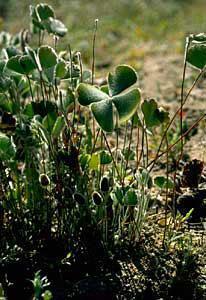 Do be careful, though, some native plants can be environmental weeds in your area. For example, Sydney Cootamundra Wattle (Acacia baileyana) is a weed in Victoria, and the beautiful Western Australian Blue Bell Creeper Sollya heterophylla is a weed in the eastern states (although Austraflora has developed a sterile variety that is not a weed – Sollya heterophylla x parviflora ‘Edna Walling Blue Bells’, shown here). There is also information on the website of the Australian Native Plants Society (http://anpsa.org.au/). Don’t assume, though, that because a plant is indigenous or native, it will be drought tolerant. Some are from riparian (waterway) environments, so are used to having ample available water. 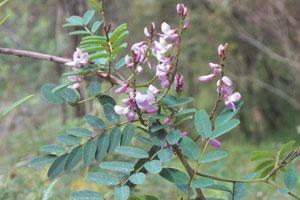 Indigofera australis (shown here), is an example. 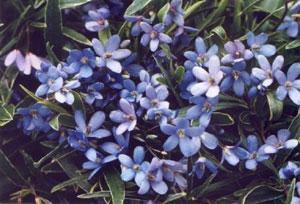 It is an elegant small shrub that is indigenous to all States of Australia. It is found naturally mainly in riparian environments and damp forests. Exotic plants are plants from other countries. There are many suitable exotic plants that are drought tolerant species or are suitable for your site, but do check that the plant selected is not a weed in your area. 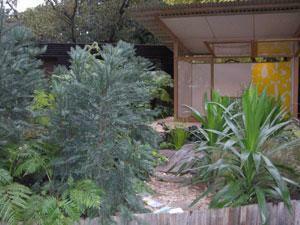 There is no reason why you can’t incorporate a mixture of indigenous, native and exotic plants in your garden. Obviously if you are including a vegetable garden and fruit trees, then exotic plants will be necessary (although there is also the possibility of exploring bush tucker!). Be careful when placing plants that, over time, you won’t be shading areas that you don’t want shaded. This is especially important with regard to the northern aspect, as the sun is lower in the sky in winter and allowing winter sunshine into the house or corners of the garden is very desirable. The other side of that is creating shade where it is required. Providing shade to western exposures is a good idea, so think about taller trees and shrubs here (where possible). Deciduous plants can be planted closer to the house, whereas evergreen trees need to be placed well away, to avoid casting shade in winter. Consider competition between plants over time too (for sun, water, ventilation). You need to allow plenty of room between large trees and shrubs. Consider the size of the plant at maturity when drawing them on your plan. Another factor is to incorporate plant-stacking where larger trees or plants can create shade and wind-protection for shade-loving species. Similarly, plants can be zoned according to their water needs, so water isn’t wasted. 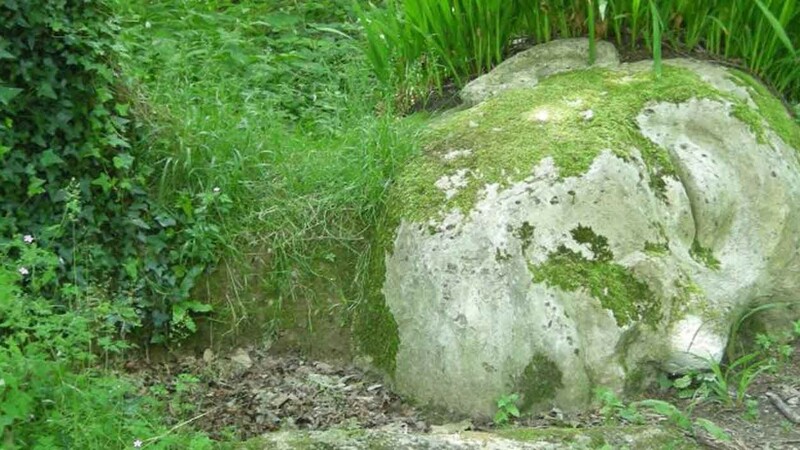 Plants needing more H2O can be placed ‘down-slope’. Also be mindful that you won’t be creating a future problem because you are placing a tree too close to a building or to drains. There are web-sites that will list trees with invasive roots, in your local area. And consider your neighbours too. Don’t plant large trees close to boundaries, without your neighbour’s consent, for example. Not only can the microclimate vary from one corner of the garden to another, but slope and proximity to buildings can also have a significant impact on plant success. For example, the south side of buildings is shaded for most of the year, and the western side can be shaded for most of the day and then suddenly be blasted by hot afternoon sun during summer. Soil conditions under existing trees and under house eaves can be quite dry. Slope and depressions can also have an impact. Depressions will often be wetter most of the year, and the top of a slope is generally drier than the bottom. Grow What Where (which also comes with a CD), by Natalie Peate, Gwenda Macdonald & Alice Talbot (published by Bloomings Books), is an excellent resource for selecting native plants for specific environments. The soft landscape includes plants, mulches and composts etc. Plant selection guides what soil preparation is needed and a lot of what else is required too. Many indigenous plants require little ground preparation, yet a vegetable garden requires considerable preparation, especially in poor soils. 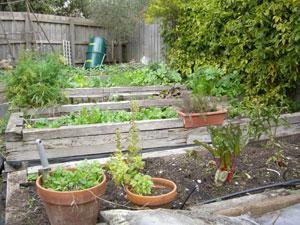 Vegetable gardens are often best built above the soil, using the No Dig Method of establishment and growing. 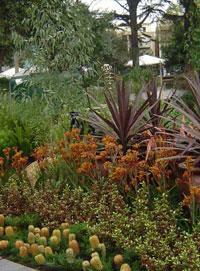 Indigenous and native plants benefit from a coarse mulch. Some prefer gravel mulches, or light loose leaf litter, so ensure you know the requirements of the plants you are putting in. Most soils will benefit from the addition of compost and for plants where soil improvement is necessary, it would be wise to consider adding the compost weeks or even months ahead of planting. There’s more information on soil preparation in SGA’s Information Pages, under Soil Health. What you now need to work out is just how much of everything you need. For those of you who have forgotten your school maths, the following formulas are the ones of most importance! Working out volumes of mulch and the like becomes very easy (especially with a calculator!). You can use a combination of mostly squares, rectangles and circles to work out the area of garden beds on your design. These formulas only give you the area, the other variable is depth. And depth depends on what you need. For example, to work out how much mulch to order for garden beds, work out the area of all the beds. Now, we usually like mulch to be up to 70mm in depth, so we multiply the area by the depth of 70mm. Be careful with units and decimal points. For example, if all the areas of garden bed give a total of about 180m2, then the volume of mulch required will be 180 x .07 (notice the decimal point has moved because we are working in units of metres). The total is 12.6 cubic metres (m3), but when ordering you would probably go up to 13 or maybe even 15 – to round it off (many of us often add another cubic metre or so for good measure!). You will need to go through the same procedure for all materials. 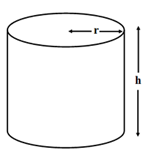 And another couple of formulas that are very useful are the volume of a cylinder (see graphic left) and the volume of a cube (see graphic right). Both or either will be useful if you have included a lot of large pots in the design, as you will be able to work out how much potting media to purchase. The hard landscape is essentially anything that’s not the soft landscape! The soft landscape includes the plants, mulch and composts etc. and was discussed above. We’re left with decking, paving, walls, and essentially the built components of a landscape. This can be a tricky area for the inexperienced or untrained, and there are some very important issues to consider before you tackle building structures or hard landscaping. Selecting the materials you want can be time consuming alone, with the amount of product available out there. But to try to make an informed decision based on environmental criteria, adds a whole other dimension! Where does the material come from? Local products require less transport, chain of custody/forest stewardship is easier to establish, and local products have less impact on greenhouse gas emissions and other negative environmental impacts. Use plantation grown timber or bamboo from a sustainable source. Look for radially sawn timber, as this technique produces more timber per log. Where do those pebbles come from? Are they mined without control in Asia? Or are they at least mined from a controlled source locally. Consider the urban heat island effect and wind-turbulence factor. The greater the proportion of hard surfaces you build, the lower the heat absorption by vegetative bio-mass that can occur and the harsher the wind-factor may be. Also, by reducing area for vegetation, you reduce the potential for ground-water cleaning, stormwater filtration and carbon uptake, as well. Factor in the amount of hard surface cleaning and maintenance you wish to do. Outdoor walling and decking can require regular cleaning, sanding and staining. Finally, consider allowing for permeable areas such as crazy paving/cobble-stones/stepping stones with space for vegetation, rather than an en masse area of non-permeable paving. Know your limitations! Simple paving may be well within most people’s scope of ability but unless you have training in bricklaying, paving, etc, think seriously about the outcome. The hard landscape is the most expensive element of a landscape. It’s also the most obvious, so a shabby job will permanently detract from the overall look. There are safety issues inherent in built elements too. We’ve all heard horror stories of DIY walls falling over. Training is obviously an option. There are plenty of short courses available through TAFE and the like, which will ensure you develop enough technique to create the more modest aspects of hard landscapes. There are times, though, when it is compulsory to bring in professionals, so be mindful of building regulations. Contact your local Council for information on their requirements, rules and regulations. Council permits and insurance are required on building projects over a certain amount (depending on where you are), so this also needs to be investigated. Contact your local council for more information to ensure your landscaping project does not breach local laws and regulations. Be mindful of easements on your property (refer to the title plan), as it is illegal to build over easements. Dial Before You Dig (1100) is an essential service to contact prior to any major excavations. Dial Before You Dig advise as to where underground services are located on your property. Even if you don’t feel confident about building the hard landscape, there is research you can undertake that will help you keep an eye on costs. Ascertaining the amount of paving and decking required uses the same formulae as used to estimate soft landscape materials, except that you don’t need to work out depth! Suppliers can often help you work out the costs of decking and paving based simply on the area. Get several quotes for materials, as this will help to ensure you are getting the best price. 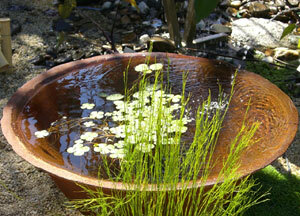 Water features in a sustainable garden are ideally designed and constructed to increase biodiversity. 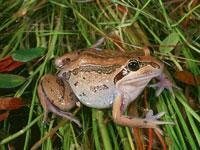 Attracting frogs to your garden is an especially satisfying reward for creating suitable habitat. Frogs are not only interesting critters to have around but they also devour huge quantities of mosquitoes, flies and other insects. 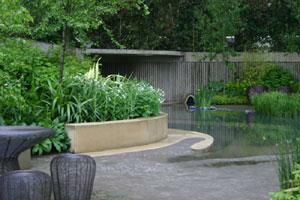 There are a number of pre-made fibreglass ponds that can be simply dug into place. 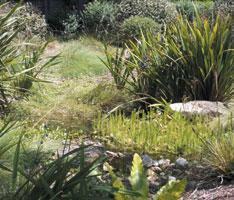 Edges and base can be hidden and the pond softened with the inclusion of rocks and pebbles. Another simple method of construction is to excavate a suitable sized hole and lay pond liner in it. The edges and base are also hidden with rocks and pebbles. When designing for a pond, it’s a good idea to consider utilising the natural slope of your block, wherever possible. Although you may wish to compromise that if you particularly want your pond in a specific place in your garden. Placed in lower areas of your garden, the pond may be fed naturally by runoff rainwater, but the other advantage is that the surrounding ground will stay damp. 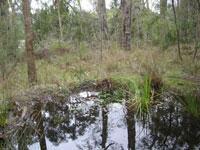 This makes perfect frog habitat because Australian frogs don’t live in water all the time. In fact, they are used to their watery habitat drying out during summer and so take to the shelter of lush grasses and plants. A frog pond can incorporate one or all of the requirements for each part of the frogs’ lifecycle. Damp bog zone for adult frogs. Shallow water zone for laying eggs. Deep zone of at least 300mm for tadpoles. Soft Water Fern (Blechnum minus), Thatch Saw-sedge (Gahnia radula), Knobby Club-Rush (Ficinia nodosa), Grassy Mat-rush (Lomandra confertifolia) and Tassel Cord Rush (Restio tetraphyllus) – this is also suitable for planting in water. Aquatic and Wetland Plants, by Nick Romanowski, 1998, published by the University of New South Wales Press (UNSWP). Australian Native Plants, by John W. Wrigley and Murray Fagg, 1996, published by Reed New Holland. There are many exotic water plants that are terrible environmental weeds, so be very discerning when you buy, and do a bit of research. Other commonly used water plants include: Purple Loosestrife (Lythrum salicaria), Tassel Sedge (Carex fascicularis), Jointed Twig-rush (Baumea articulata) and Water Ribbons (Triglochin procerum). Most fish will eat tadpoles. Tadpoles and eggs can be killed by fountain pumps. Cats and dogs will often hunt and kill frogs. Protect the frog area of your garden with sharp, spiky plants. Pesticides and herbicides. Frogs eat insects, so you don’t want to spray them. And frogs are very sensitive to chemicals, so you can’t have both. Allowing duckweed or Azolla to cover the top of the pond as it reduces the oxygen available to tadpoles. Cleaning out the pond too often. Tadpoles need some material to be breaking down in the pond water to provide food for them. Collecting tadpoles from the wild. It is illegal in most parts of Australia. It’s also unnecessary. If you provide the right habitat, they will find you! More information on particular topics that interest you can be found using the Search function on this site.